Do Not Our Hearts Burn Within Us? N.T. Wright compares the two disciples on the road to Emmaus to people who have gotten up early to watch the sunrise, but were looking westward, rather than eastward. They were like people on a hillside, watching eagerly for the sunrise. …Disoriented, they are facing the wrong way. The expected moment comes and goes, and nothing happens. Then they become aware that, though the sky they are scanning remains dark, light seems to be shining anyway. With a strange excitement they turn around, to see the sun shining in full strength in the very place they least expected it. The women had seen the empty tomb, and these two disciples knew that, but they hadn’t pieced it all together yet. To them, Jesus was still dead. So they have this road trip now to talk about the death of Jesus, the denial of Peter, the betrayal of Judas, the crowds shouting, “Crucify!”, the weeping of the disciples at the cross, and the shock and shattered dreams of the community of Jesus’ followers. One of the questions Luke is posing to his listeners and readers is: will we, when Jesus shows up, have eyes to see him? Jesus chastises the two, as only a loving and trusted teacher can do, for not understanding, for not knowing who he was. When our eyes are cloudy with tears, when we’re sinking beneath the weight of death and tragedy and incomprehensible outcomes… do we recognize Jesus? Good Friday and the days following were just an idiot’s tale, not a compelling narrative of an entire nation’s redemption. It all meant nothing. We don’t know for sure where Emmaus is–people who like to study these things have made two or three suggestions. It was within walking distance from Jerusalem, at least. But I think we do know what Emmaus was. It was an escape. It was another town, it was not-Jerusalem, which was just too painful a place for these two disciples to be. It was a pre-emptive break from the regular weekday schedule that surely awaited the disciples on Monday morning. Those routines would have been unbearable with Jesus gone. So at least if they could go somewhere where the buildings and mountains and water wouldn’t remind them of him, maybe their sorrows could be numbed a little bit. They were done. It was over. 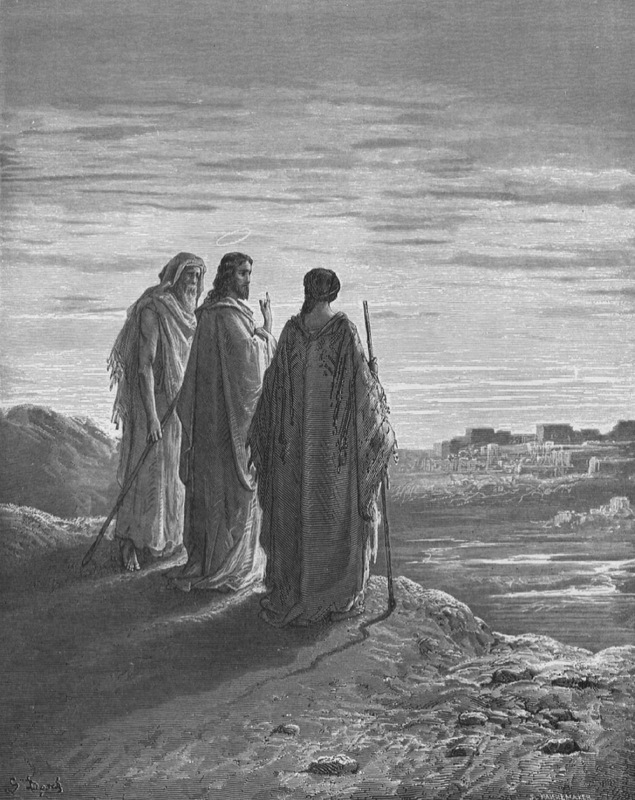 The road to Emmaus was a road of confusion, frustration, and tears. Then Jesus shows up. They don’t know it’s Jesus. It’s another fellow traveler, and it would not have been weird at all for them to walk together, even if they hadn’t met. “They were kept from recognizing him,” Luke says, a curious phrase. Was it their own sadness that kept them from seeing? Was it lack of faith? Did they think, “Hey this guy does look a little like Jesus, but no way it’s him”? Did God somehow keep them from seeing, so this scene could play out? When he asks what they’re talking about, they can hardly bring themselves to re-live the tragedy. Cleopas does his best and, surprised that anyone wouldn’t have heard the front-page news, he goes on and tells about the criminal’s death his supposed Savior died. [W]hat is more, it is the third day since all this took place. In addition, some of our women amazed us. They went to the tomb early this morning but didn’t find his body. They came and told us that they had seen a vision of angels, who said he was alive. Then some of our companions went to the tomb and found it just as the women had said, but him they did not see. They knew this was the “third day,” when something was supposed to happen. And they knew the tomb was empty. And they knew the women were excited and had seen angels at Jesus’ tomb. But they hadn’t yet seen Jesus alive, outside of the tomb. Jesus then goes through the Scriptures (“Moses and all the Prophets,” or the whole Old Testament) and shows how it all points to him. Now they know Jesus, in the breaking of the bread. Perhaps they recall the feeding of the 5,000, or the Last Supper that they had probably heard about from the other disciples who were there. On both of those occasions, Jesus took bread, gave thanks, broke it, and distributed it. Jesus appears to them through the reading of Scripture and through fellowship at a table. Time and time again the early church and the church throughout the ages would gather to hear the Word of God proclaimed and the sacrament of communion celebrated, and in so doing the church would continue to recognize its risen Lord. During an Easter hymn two weeks ago, I was filled with awe at just how transforming the resurrection is for those who believe in it. I began to think, “What if we remembered more often, both when we’re together and when we’re apart–what if we remembered more often that we worship a risen Jesus, and Christ’s resurrection completely transforms how we see the world? The victorious life over death of the resurrected Jesus is foundational to our identity.” We worship a Lord who could not be shut up in a tomb. Therefore, we, too, are resurrection people, disciples who have been forever changed by Christ’s victory over death. 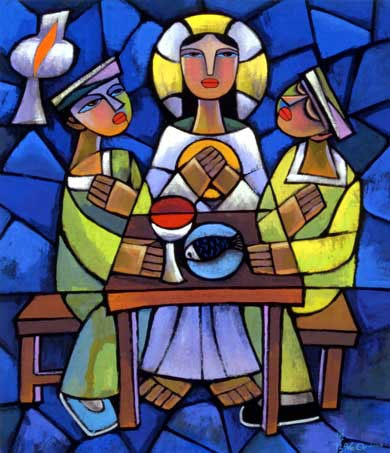 Do not our hearts burn within us when we gather to hear God’s word, and when we break bread at Christ’s table? And do not our hearts burn within us, as we see Jesus in each other, at brunch or meals in each other’s homes, at coffee, through small group prayer, and notes of encouragement? Do not our hearts burn within us when we realize we’re not alone on the road, but have each other for traveling companions? Do not our hearts burn within us when we truly recognize Jesus through an encounter with him? 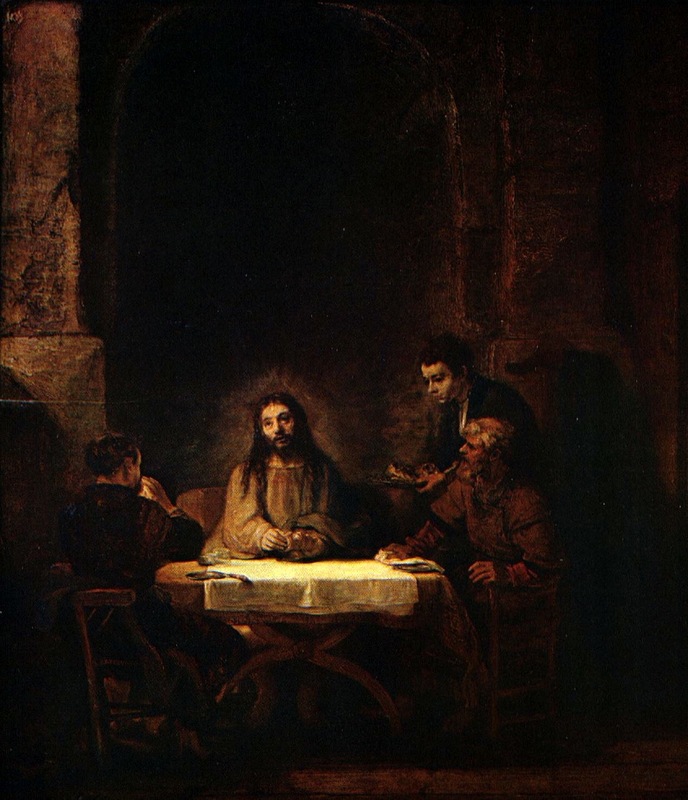 And this encounter with Jesus is just as likely to take place on our defeated path to Emmaus… in those moments where we walk away from our hopes and dreams and visions of the future that are now traded in for just the hope of making it to lunchtime…. We see Jesus on our roads and sidewalks, because he comes and finds us there. We weren’t even looking for him. We didn’t even recognize him, and he came–the resurrected Lord, giving us his broken body and blood for our new life–he came and enlivened our hearts, rekindled our passion, made us excited about something again. Jesus gave us renewed purpose and vision. Jesus offered us hope when we were grasping at straws. This becomes a foundational truth about our identity, our make-up as believers in Jesus. We are a people who have seen the risen Lord. We may invite him in as a guest to our gatherings, as those two road-walkers in our passage did. But we quickly find Jesus himself to be host, the one who invited us into fellowship with him in the first place. And do not our hearts burn within us as we hear his invitation to come to his table? Come, see Jesus now. The table of fellowship is set. Recognize him as he opens his table to us who journey along the road. And let your heart beat a little bit faster as you encounter the risen Jesus there. The above is adapted from the sermon I preached on Luke 24:13-35 today. All Scripture quotations come from the NIV (1984) or TNIV. See my other sermons, if you desire, here. The image at the beginning of the post is used and covered under the Creative Commons Attribution Noncommercial ShareAlike 3.0 License. Next Post O Lord or Oh, Lord? Thanks for this, Abram. Reminded me of this Denis Levertov poem on the same topic….